After struggling with his own addiction, Salt Lake City native Ferril Trevor Davis joined childhood friend Dominic Suazo to start the clothing line Party Sober in 2012. Davis, who now works as a sober companion for recovering addicts, created Party Sober as a lifestyle movement to promote sobriety to youth and those struggling with addiction. Davis and Suazo’s website, PartySoberClothing.com, offers shirts, shorts, hats and even paintings, all promoting sobriety. Davis spoke with City Weekly about what it means to Party Sober. How does one party sober? It’s not necessarily the idea of being someone at a party who’s sober, you know, the dork in the corner that’s not having fun. It’s a lifestyle. When you’re passionate about something and you want to go for it, it’s a lot easier to obtain that goal if you’re coming from a sober mindset. It’s the idea that you can have a great time without drugs or alcohol. What inspired you to start Party Sober? We’ve both gone down that path of drug addiction. We’ve both lost a handful of friends—people that we were in high school with, just from our graduating class alone—that have either ended up in jail, in prison or in a coffin from drug use. You turn on the television or listen to the radio, and drug abuse is glamorized. Nobody is stepping up and representing a sober life. It wasn’t until we each got sober around the same time—about three years ago—that we realized that, you know, life is truly amazing beyond addiction, and you don’t need anything like that to have a great time. And we always wanted to start a clothing line, but they’re a dime a dozen these days. But we wanted to do something that actually has meaning, something that we’re passionate about, and something that can serve as a message. What reaction have you gotten from selling your merchandise? We did Warped Tour last summer and we do a ton of events like that. We like to do shows and community events. People walk by, and oftentimes they’ll come up to the booth and start trying to badmouth us, bring us down and kind of try to make fun of what we’re doing. But more often than not, they walk away having purchased a shirt, from just taking five minutes to let us explain what we’re doing. It’s something different, and it’s something that a lot of people don’t understand, but I think that that can be positive for us. What sets you apart from other clothing lines? 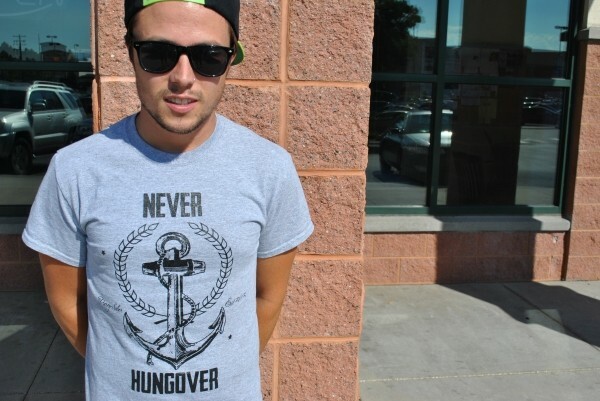 I don’t think that there’s another local clothing line promoting sobriety that is not straightedge. Although we entirely support straightedge kids, we’re not a straightedge-exclusive company. We just try to promote a sober lifestyle, whether it’s to recovering addicts or alcoholics, or somebody who’s lost someone to drug addiction, or somebody who’s always been sober and is proud of it. I don’t think anybody else is doing that. What do you think of the more aggressive straightedge campaigning in Utah culture? I think that there’s been a negative connotation that comes with Salt Lake City straightedge, unfortunately. We believe that what straightedge stands for is beautiful, and a lot of straightedge kids love our stuff. I think it’s just like anything, really—you have the crazy, aggressive animal-rights activists, or … you know, people that stand for any organization and take extreme measures. They reach media level, and that’s what the news portrays of them. Isn’t the commanding message “Party Sober” sort of intimidating? I think that it could be intimidating just because it’s different. It’s not what people are used to seeing. It’s tough for people to think about what it would be like to be sober because a lot of people have never experienced that. At the same time, we’re really not trying to be “holier than thou,” or tell people what to do. It’s not about that at all. It’s more so something that we believe in, and something that you could think about if you want to. What’s next for Party Sober? Fundamentally, we have a mission that is more than just clothing. Our overall mission is to portray a lifestyle that’s positive and, ultimately, we’re also trying to give back. Our clothing line is a forefront of a movement, as opposed to just a business—we’re actually doing something that we think can better our communities and better our society. By purchasing a shirt, you’ll know that, sooner rather than later, we’ll be at a point where we can financially give back, as well as have a place—like, an actual location where Party Sober is a hub for community gatherings, a safe haven.